I rode in Adam's backpack to his school. Adam was very careful on his bike with all the traffic, people, bikes and cars. I didn't see how dangerous this was because I was inside the backpack with the school snacks. Adam is Avery's cousin, he is 8 years old and in Group 4. His school has a really long name: Vleuterweide Openbaar Basisschool or Vleuterweide Public Elementary School. Adam's teacher is Juf Neenke (YUF Nain Kah) and she was happy to have me in class today. She is a kind and strict teacher. Just what an 8 year old boy needs. She introduced me to Adam's Group 4 classmates. I think this is like 2nd grade. 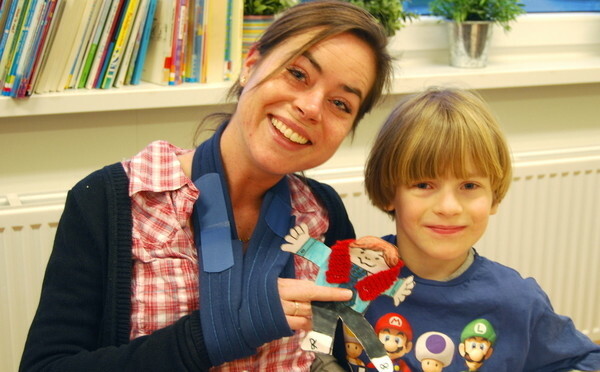 I felt very proud, special and lucky to be doing this project and spending the day in a real school in Holland.